Armenia’s top religious official has been dragged into a feud between the Russian and Ukrainian churches and appears to have sided with Russia. 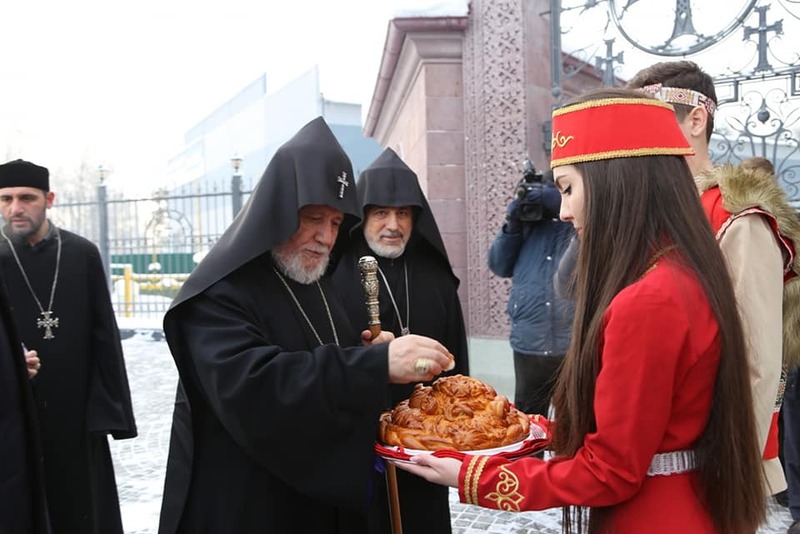 Catholicos of All Armenians Karekin II was consecrating a new Armenian church in Novosibirsk, Russia, made from Armenia’s trademark pink tuff stone, when he was asked about the schism that has rocked the Orthodox Christian world. In October, the Russian Orthodox Church announced that it was cutting ties with the Constantinople Patriarchate, following the latter's declaration of support for an independent Ukrainian church. The Armenian church is not part of the Constantinople Patriarchate and does not have a direct stake in the conflict, unlike many of the other national Orthodox churches that are being forced to take sides in the dispute. Karekin nevertheless weighed in. “The Armenian Apostolic Church is a supporter of canonicity. And in this regard, one can never welcome steps that are aimed towards division, dismemberment of the church,” Karekin said at the November 19 ceremony. But one senior Ukrainian church official denied that Karekin had taken a side in the dispute. “Some understood the statement as condemnation of the provision of the Tomos to Ukraine. Where did you see any note regarding Tomos in the statement of Karekin II?,” said Archbishop Yevstratiy, a spokesman for the Ukrainian Orthodox Church of the Kyiv Patriarchate, referring to the official granting of autonomy, or autocephaly, to the Ukrainian church. He added that the Armenian church – the first official church in the world, after Armenia adopted Christianity in 301 – had no direct relation to the Ukrainian or Russian churches. And he blamed Ukrainian journalists for mistakenly reporting the story by following Russians’ lead. Karekin and other church officials, meanwhile, failed to clarify the church’s official position, and Armenian media have left the story alone.